From 1985-2017 the Vagary grew quality perennials, native plants, and herbs for sale in the Minneapolis/St. Paul Twin Cities area. We have sold plants at a variety of venues, including the St. Paul Farmers' Market, neighborhood markets, special one-day events, and sales at our home. In the past few years we have limited our selection to native plants, and have limited retail sales to a few sales events. The Vagary held its final sale in June 2017, and is no longer in business. We offer heartfelt thanks to all of the loyal customers who have supported us through over 30 years of growing and selling plants. As we become acustomed to retirement we will think about the future of this website. For the time being we will maintain it to continue to provide information about the plants we have sold. 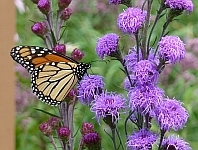 In the past few years the Vagary began to focus on pollinator plants, especially plants that support the Monarch butterfly population that spends the summer months in Minnesota and migrates to central Mexico for the winter. While there are many plants that serve as a nectar source for Monarchs, other butterflies, and other pollinator insects, milkweeds are especially important because they are the only plant that acts as a food source for Monarch caterpillars. Minnesota Milkweeds for Monarchs is a summary of six popular species of milkweeds native to Minnesota that we sold. It includes good information on why milkweeds are important, which species are best suited for various landscape settings, and general information on growing milkweeds.